A little background on me will be useful when talking about this sword's handling. I ran a German longsword study group about 10 years ago, so I know the basics of how a sword is supposed to feel and function. I am used to swords like Lutels and Del Tins, which are definitely on the heavy side. Compared to what I'm used to, this sword is a beauty to handle. In one hand, it's easy to strike, recover and change directions. In two hands, it floats like a steel feather. Part of that is due to the pretty aggressive rate of distal taper, resulting in a very thin and flexible tip area. To compare it to a sword most of this forum may be familiar with, it feels more like an Albion Crecy than anything else. There's no question that this sword feels very lively, well balanced and responsive in the hands, but is that appropriate for a weapon of this kind? XIIas from other makers that I've handled (Lutel, Del Tin, Albion, MRL) have had more of a forward cast to the blade to aid in the cut, while the Savoy definitely has a more neutral feeling. That livelier feeling MAY translate into poorer results at the cutting stand. When I am able to set up cutting tests with this sword, I'll report back with results. I'm not going to talk around it: in terms of fit and finish Valiant Armory is the best in this price level. I love how this sword looks. The blade is taken to a medium-gloss finish which sets off the darkened cross and pommel perfectly. The cord-under-leather grip wrap is excellent, with a very unobtrusive glued seam. I don't really mind those imperfections, they give the piece some handmade charm in my eyes. But they are something to keep in mind if you want your swords to have machine-perfect lines. 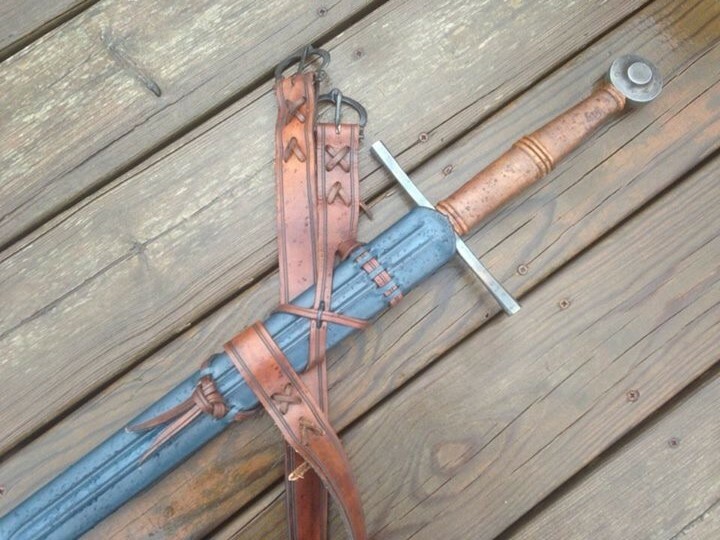 One of the the big selling points of Valiant Armoury is that their swords come with a scabbard included at a reasonable cost, and it is gorgeous. In fact I'm tempted to say it's flawless, as I have been turning it over in my hands for the past hour and can't find any imperfections. The colors are beautiful and the leather has no blemishes whatsoever. The backseam is overlapped and glued in a way that forms an even, raised ridge. The scabbard mouth has a perfect grip on the blade; it won't move when shaken upside-down, but easily slides out with a firm grasp. It's svelte, too. I've had scabbards from other makers which could double as boat oars they were so wide and heavy. 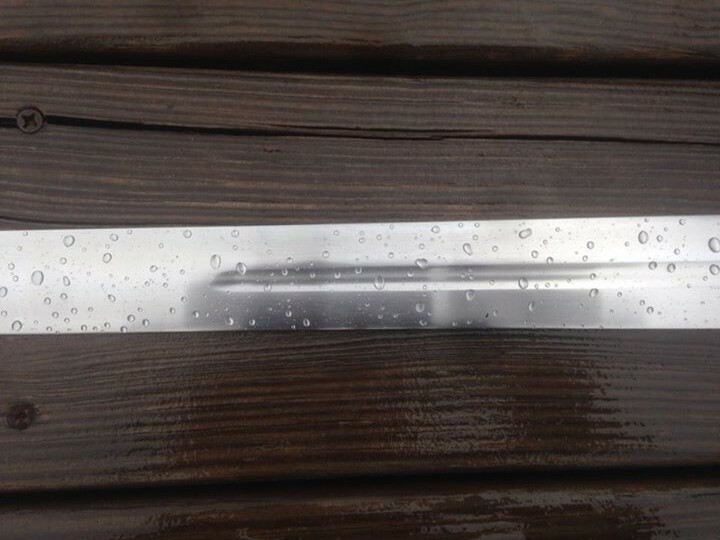 The Valiant scabbard is slim, light and just wide enough for the blade, with no excess material. It's not as ornately decorated as some of the scabbards I've seen, but what decoration is there, is very well done with no flaws. 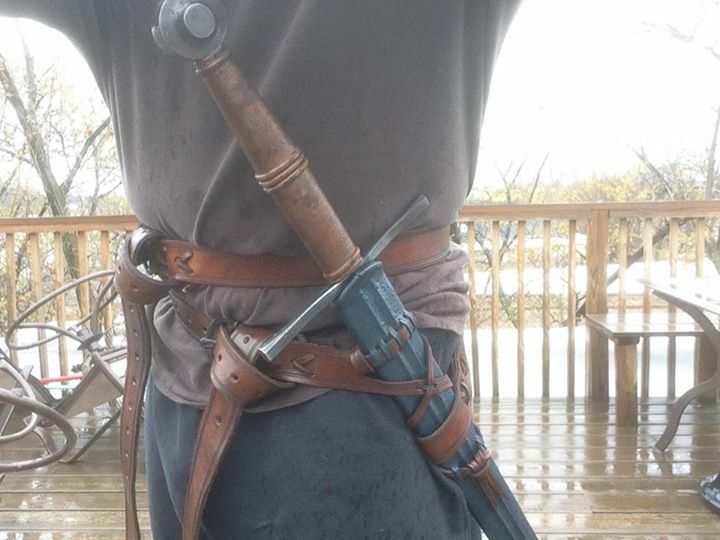 The double-wrap belt is made of a good quality heavy leather, and holds the scabbard securely pretty well. The double belts are connected at the small of the back with a leather cord, which can be removed if you want to wear it as a single wrap suspension. Again, absolutely no complaints here. 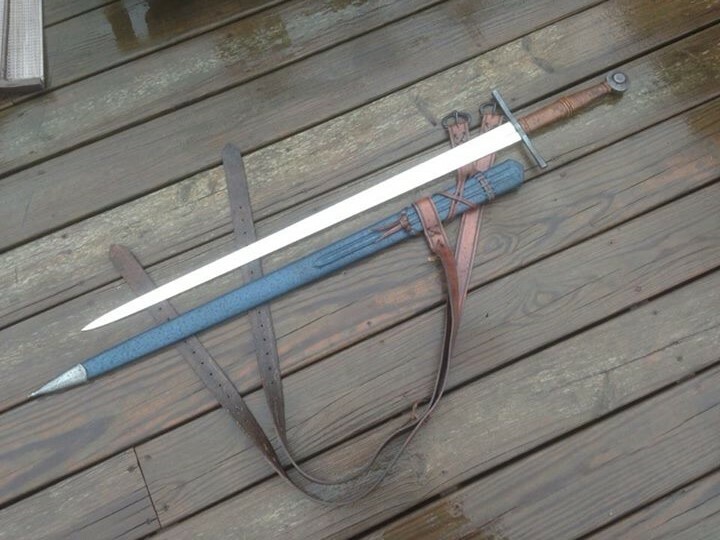 Overall, I am very pleased with this sword from Valiant Armory. Sonny was prompt in his communications, willing to customize, and for the price, I feel there's no better bargain. I would recommend this maker to anyone who asks. Nice setup, I love XIIA's! I expect it will be a good cutter, I have a semi-custom A&A Durer that's a few inches longer but weighs about the same as your sword and has a POB about an inch closer to the hilt but it cuts very well all the way out to the tip even though the blade doesn't exhibit much distal taper. If you don't have one already you should totally get a great helm to go with your sword! There's some decent repro's out there for not much money. Very nice setup and good review. I didn't know Sonny offered hilt-darkening, so that is good to know. Thanks for the review. 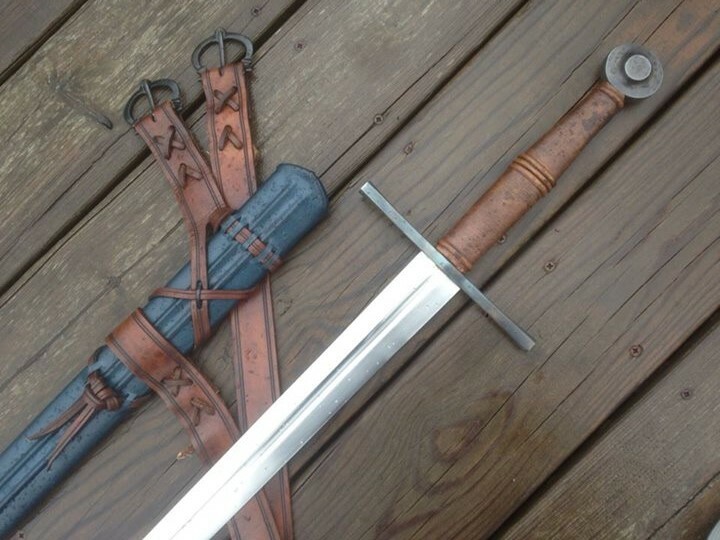 I saw this on the VA Facebook page, and it made me reconsider what my next sword is going to be. 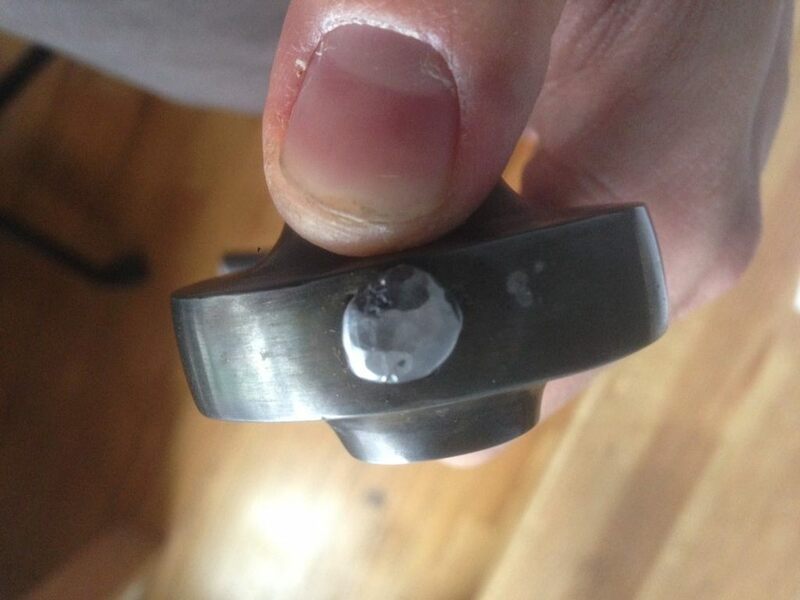 I'd say it looks almost like an XVIa, with the fuller length and the diamond cross section after the fuller. I sort of agree. It's almost a hybrid between XIIa and XVIa. The Savoy is actually advertised as a XIIIa which is kind of a head scratcher. I believe the Savoy used to have a different blade, one with a much less acute point. I'm guessing the product page wasn't updated when the blade was changed.